Netflix getting in on the Marvel universe is the kind of news that was so huge, the only way you didn't hear about is if you were Sandra Bullock or George Clooney floating in space and the exploded debris of a satellite had knocked out all of your contact with Earth. But even though the news was huge and it spread everywhere instantly, we actually didn't know a whole lot. We only knew the roadmap: Daredevil, Jessica Jones, Iron Fist and Luke Cage would be getting their own shows, with each series feeding into a miniseries event where all of the characters would come together as the Defenders. Now we know a bit more about one road on that map. 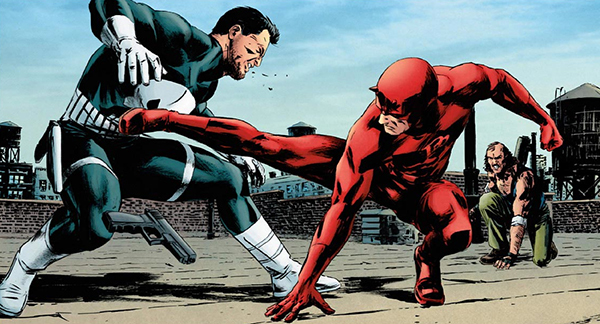 The Wrap is reporting that Drew Goddard will be writing the Daredevil series. This is great, great news. Most recently Goddard saved World War Z by helping rewrite its original ending, and before that he cowrote and directed The Cabin in the Woods. But he's no stranger to TV, having spent the bulk of his career writing and producing a few tiny shows you may have heard of called Buffy the Vampire Slayer, Angel, Alias and Lost. He also happens to be a massive Daredevil fan, and has gone on the record saying he wrote Daredevil quotes on his walls when he was in high school. So, yeah, we'd say he's a pretty good fit for the 13-episode show. And just for kicks, here's the proof-of-concept reel that director Joe Carnahan had put together last year when he was trying to get his own Daredevil movie off the ground at Fox. It's a safe bet to assume this won't be the style of the show, we're just showing it as a reminder of what could have been.